Sicilian skillet chicken is a quick and easy dinner recipe, full of authentic Italian flavors. Serve it alongside healthy Parmesan zucchini noodles for a dinner the family will love! *This post is sponsored by McCormick in conjunction with a social media campaign through Sunday Supper LLC. All opinions are my own. Simple and healthy meals are a necessity for us during the week. Some weeks I do great prepping food ahead of time and preparing for the week ahead and other weeks, well…not so much. When I’m in a hurry and time is of the essence, it’s important that I can get a nutritious meal on the table without a lot of fuss. The new skillet sauces from McCormick are a great way to whip up a quick and tasty dinner in less than 20 minutes. Sicilian Chicken with Tomato, Basil & Garlic. I love the flavors in this Sicilian skillet chicken dinner and I can’t think of a better side dish accompaniment than my favorite zucchini “noodles” with a buttery Parmesan coating. 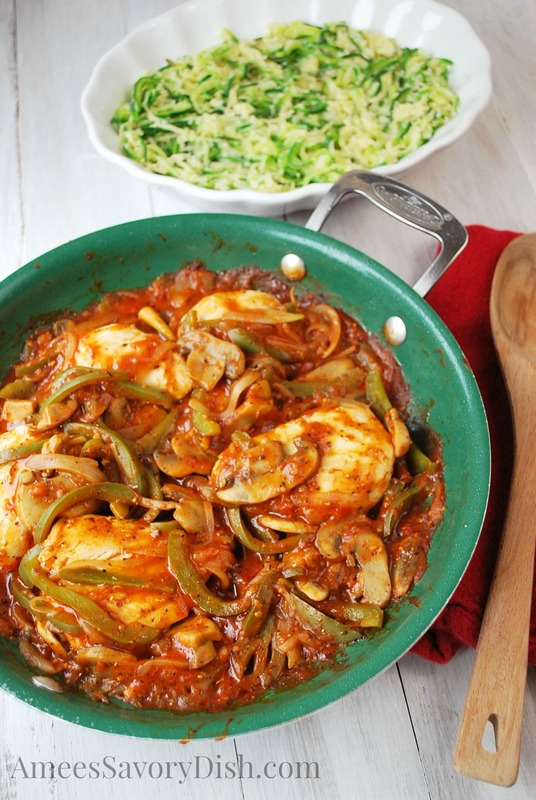 This Sicilian skillet chicken is a BIG hit for us! Thank you McCormick for making healthy meals a cinch! A spiral slicer is the key to making perfect vegetable “noodles”, so if you don’t have one I highly recommend it. I’m a little obsessed with mine. Don’t miss my Zucchini Spaghetti, Skillet Zucchini and Sausage Parmesan and Zucchini Salad…so easy and good! Aren’t “zoodles” super fun?!! Rinse zucchini and slice off stem and a small 1" piece of the other end. If using a spiralizer, cut a small slit lengthwise in the zucchini (this shortens the strands so they aren't super long) and place into spiral slicer. Slice into "noodles" and place into a medium-size bowl. If you don't have a spiral slicer, you can use a vegetable peeler and cut into ribbons or a julienne slicer and slice into tiny strips. Bring about 3 inches of water to a boil in a pot with a steamer basket. While water begins to boil, prepare the chicken. Heat oil in a large, non-stick skillet over medium-high heat. Add chicken and cook for about 5 minutes, flipping once until each side is lightly golden. Add your vegetables to the pan and add 1-2 tbsp water or chicken broth to deglaze the pan, you want to scrape up all those tasty bits of flavor from browning the chicken. Cook vegetables until soft and water has evaporated, about 5 minutes or so. While zucchini noodles steam, add skillet sauce to the vegetables and stir to mix. Add chicken breasts back to pan and stir well to coat. Reduce heat to low, cover and simmer for 3-5 minutes until sauce has slightly thicken and flavors have mingled. Drain zucchini really well and toss in melted butter. Place parmesan cheese into a food processor and chop until resembling coarse bread crumbs. Toss buttery noodles in parmesan cheese and spoon into a serving dish. Season with sea salt and pepper and sprinkle with fresh parsley. Serve alongside skillet chicken and enjoy. In addition to my Sicilian skillet chicken recipe, here are more simple and delicious McCormick inspired dishes from my Sunday Supper friends! I seriously need to get one of those spiralizers. I am totally missing out on the “zoodles”. It’s the best gadget ever Renee!! Love when tasty and healthy meals collide. This looks wonderful! Me too Renee! Thank you! I love “zoodles” and this dish is soo perfect! TWO marvelous recipes!! 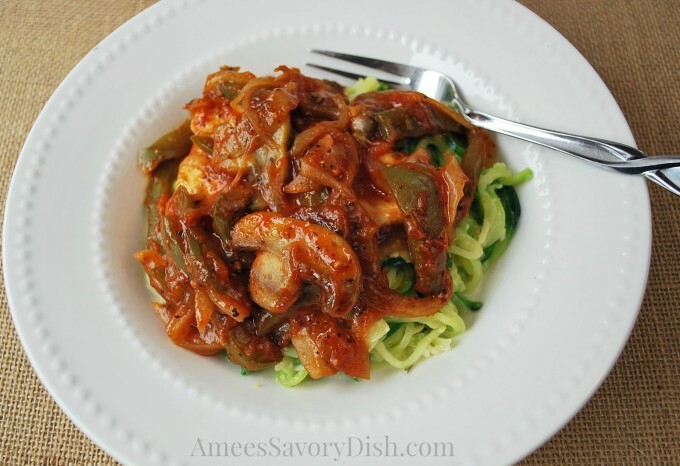 Love your skillet chicken with the deliciously sauced mushrooms and peppers—and serving it over parm zucchini noodles sounds like an amazing pairing!!! Mmmm….what a yummy recipe! Love the zucchini noodles! Thanks Constance! They are the best! Fantastic recipe! I’ve got my spiralizer ready to go! Totally digging on this! Yum! This looks so tasty! I’ve never tried veggie noodles, but they seem to be so popular these days! Thanks Katie! You need to try them, so yummy! This recipe looks amazing and it is totally inspiring me to make zucchini noodles. Isabel, you should! They are so easy and good!! Thank you! I need to try this ! 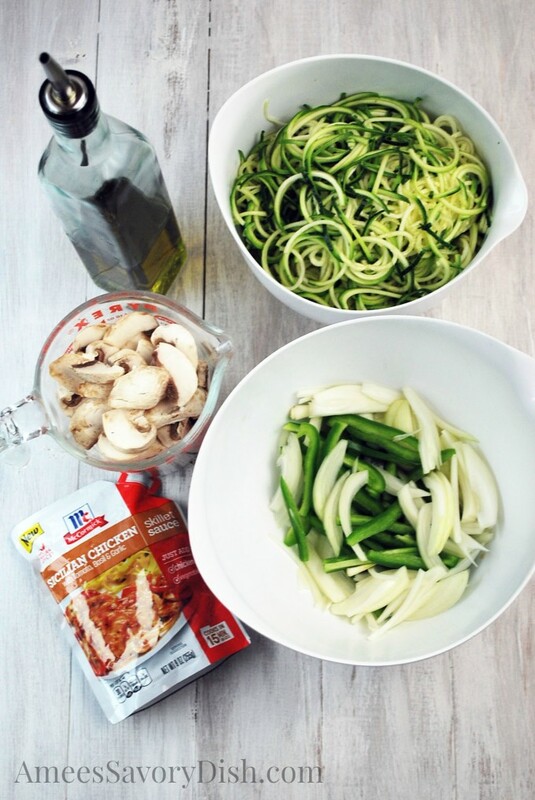 I still haven’t used my veggie spiralizer yet and these “noodles” look delish! You need to try it Hezzi, it’s awesome! I need to find the Sicilian Skillet Sauce because I’m seeing some amazing dishes using this sauce! I bought a spiralizer last summer, but I have yet to make zoodles! Need to get on that! 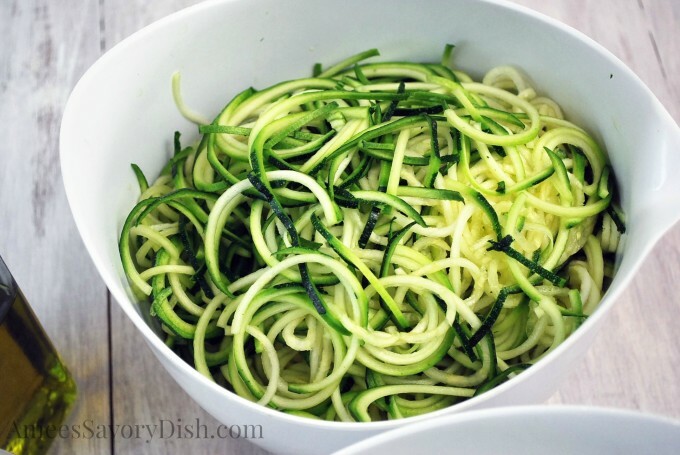 I’m not a big fan of zucchini noodles but these look so good! 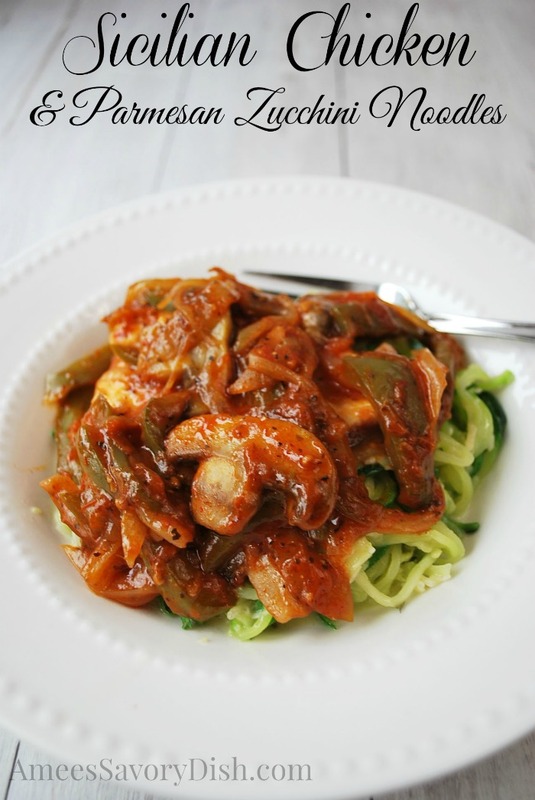 What a perfect idea to serve the yummy Sicilian Chicken over some zoodles! That’s what I’m doing the next time I buy it! I loved your version, too, Brianne! Spaghetti squash and zoodles are a favorite here! I have GOT to get one of those spiral cutters! This looks soooo good! Yes, do it! You’ll love it Bobbi! Love that you served this over zucchini noodles!!!! Looks delicious!! Wah….I can’t find my spiralizer! I had one of those little hand-held ones. I need it to make your wonderful dish!